Access to basic services has an influence in improving the standards of living and quality of life of the people living in the municipality. According to Stats SA (2011), currently 15% of the community have access to proper sanitation, 57% to decent water facilities, and 32% to electricity. In addition, refuse removal services are only available to 13% of the constituency. These are areas that the municipality is desperate to improve in the short- to medium-term. The municipality intends building houses for the Indaka community as part of a new development plan. 47% of the local population still live in traditional homes. The construction process has commenced and it is yielding positive results. Health services are currently the responsibility of the Department of Health. The new legislation on local government has not provided that the local municipalities are responsible for the health services in as far as they are provided to serve their area of jurisdiction. Therefore services like clinics and mobile clinics can be safely assumed to be the responsibility of Indaka Local Municipality. Currently there are 7 clinics at Indaka, namely; Limehill, Ekuvukeni, Rockcliff, KwaMteyi, Mhlumayo, Gcinalishone and Sahlumbe. The total number of mobile clinics that operate in the municipal area is 13. These mobile clinics are spread all over the area but there are some areas that still need mobile clinics. There is only one police station in the whole of Indaka Local Municipality – at Ekuvukeni. Communities of the Mhlumayo settlement have called for stronger and more visible police presence in their communities (David Totman and Associates: 1999). The SAPS Crime Information Analysis Centre at Ezakheni Police Station stated that the Umhlumayo complex is being served by the Ezakheni Police Station whereas the Limehill Complex is served by the Ekuvukeni Police Station. Whilst the centre acknowledged the increase in the rate of crime in the Indaka area it was however made clear that there are no immediate plans for the construction of a new police station in the Indaka area. It was also acknowledged that the SAPS are currently under-resourced in terms of personnel. The administration of Indaka Local Municipality is headed by the Municipal Manager, and consists of four Departments, namely; Corporate and Community Services, Housing, Development and Planning Section, Technical Services, and Financial Services. – The Indaka Local Municipality has had to operate with an average staff vacancy rate of 20% for the better part of the 2012/13. This was mainly due to Disciplinary Hearings following a forensic audit. Two senior managers were on suspension, and the departments were managed by people on acting capacity for much of the year. The current Municipal Manager, Mr KS Khumalo, was appointed in May 2012 following the dismissal of the then Acting Municipal Manager. 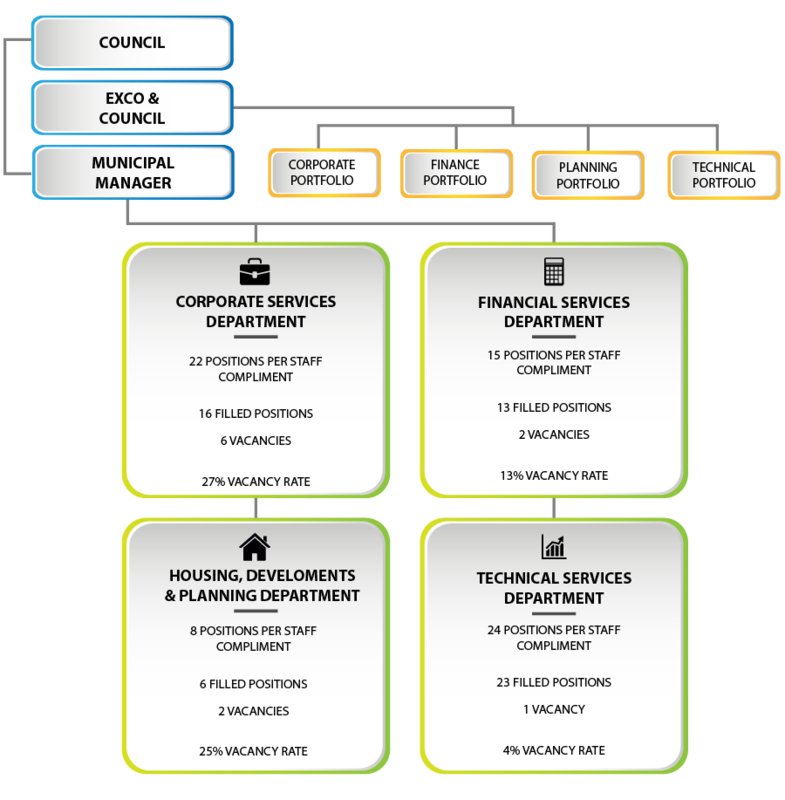 The presence of a new administrator has brought about a shift of focus to the core municipal capabilities and functions. This has resulted in the refinement of both the Performance Management Systems (PMS) and the Integrated Development Plan (IDP). The arrival of the current administrator resulted in the restructuring of the 2011/2012 budget thus eliminating the non-core municipal services. That assignment culminated in the huge savings.Total income budgeted is R85 024 084 translating to the actual revenue of R80 069 517. Total budget for expenditure was R83 504 669, the total operating expenditure was R39 637 771 thus giving a budget surplus of R43 866 898. The above figure for budget expenditure includes both capital and operating expenditure. The actual expenditure as indicated above reflects only the operating expenditure. The capital portion of the expenditure is accounted for differently in the Annual Financial Statements. Budgeted revenue for the year was R85 024 085. The actual revenue was R80 069 517. The variance between the two is R4 954 567. The reason for the variance is the combination of poor budgeting and the fact that R3 076 000 an amount was withheld by the National Treasury from the original allocation of equitable share for the year due to the failure of the Municipality to account in terms of Division of Revenue Act (DoRA) for the unspent conditional grants for the previous years (2005/2006 to 2008/09). There were many challenges during financial year regarding the implementation of Municipal Property Rates Act (MPRA). Some of these challenges stem from the nature of content of the property rates policy of the Municipality. These included a blanket exemption of all properties of R50 000.00 and below. This meant that more than 90% are exempted from paying rates; thus leaving less than 10% of rates payers liable for the payment of rates. The cost of the management function was more than the actual revenue received from the rates payers. Another factor is that there are no postal addresses where the statements can be posted to. These MPRA challenges will be addressed in the 2012/13 financial year. The table above shows expenditure budget of R83 504 669, the actual expenditure of R39 614 704; giving a surplus balance of R43 889 965. The main reason for the containment of the actual expenditure against the budgeted expenditure was stringent control on expenditure. It is worthwhile to note that at this stage that although budget for 2011/12 was approved before the start of the financial year; the expenditure on each vote was reviewed in September/October 2011. The purpose of the review was that expenditure on the non-service delivery is kept below the budgeted figure. The above picture reflects that the object of the budget review was achieved. This page is currently under construction and will be updated with the relevant information shortly. Should you wish to make contact with us in this regard, please contact at: Tel 034 261 100.